Little nostalgic feeling! I was hired to illuminate this property maybe fifteen years ago by the owner, Jerry Moore. The home was a French chateau, broken down brick by brick, and rebuilt with a underground 26 car garage for his collection. At the time, Mr. Moore was my first client on the Forbes list from his dealings with shopping centers. Jerry wasn’t the kindest man and there are quite a few stories to back up his “attitudes”. I was confident in my abilities but he intimidated the heck out of me. The day we were to start the installation, we had to cancel and I called Jerry to reschedule. He wasn’t having it and went on a tirade calling me everything from a lying f*** to f***ing little ***hole! I took the abuse for a bit and to my surprise said, "Jerry, are you going to shut the f*** up for a second" He went quiet, asked for my boss, who then proceeded to tell me that Mr. Moore would like to see me Monday morning on site. Surprised I wasn’t fired, I went to meet Jerry and was amazed when he welcomed me with a handshake and put his arm around my shoulders…he damn near hugged me! We walked around while he told me stories, took me inside, and even showed me his car collection. Jerry passed away about ten years ago and the property has sat stagnant all this time. Drove by last week and noticed someone finally living there…it is one hell of an estate! At the time, my boss was almost 80 and had seen it all. He said Jerry enjoyed walking over everyone but I earned his respect when I stood up to him. He said, remember you’re the expert and don’t ever do it again. 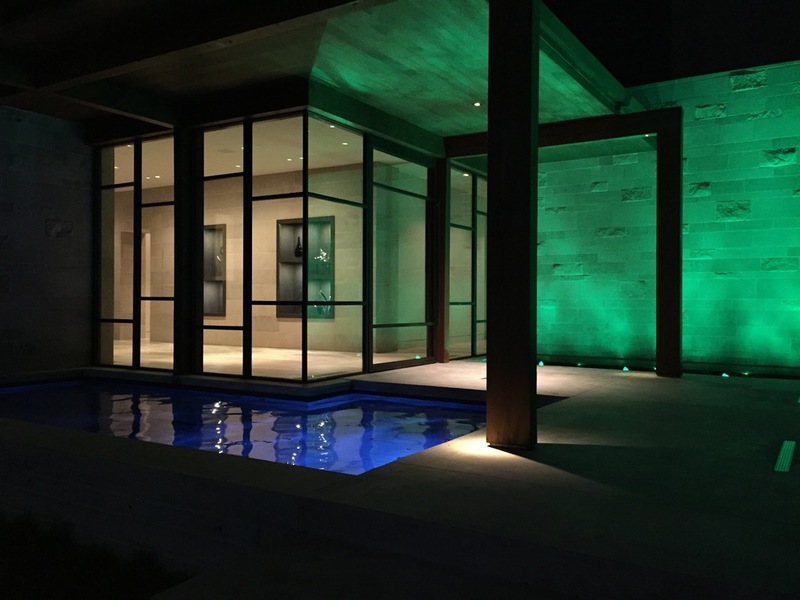 The perceived value in landscape lighting isn't the number of lights you're buying but the quality of the design. I'll never understand how a homeowner allows this to happen. This is NOT landscape lighting, but someone selling lights. If I have to explain why this lighting example isn't representative of quality work, than you my friend need to find another career. In my humble opinion, the concept behind landscape lighting is seeing the effect of the light...not the actual light fixture. This is disturbing on so many levels; 1) One light per trunk 2) Placement of the lights on the front of the trunks 3) This lighting example is at the front entrance for all the neighborhood to see...AND RUN FROM! If you're considering the investment of landscape lighting for your home, please call a reputable company and request a design for your home. If someone starts the sales process by talking about the number of lights they can sell you, kindly throw them off your property. Landscape lighting can either do two things for your home...enhance and beautify or illustrate the mistake you made nightly. Choose wisely. I see this common mistake throughout DFW on projects that deserve better. Personally, I believe either the landscape contractor doesn't know any better or just doesn't care about their quality of installation. Hopefully this post will reach some of them and they can improve their installation quality with a simple solution. Why is this installation a mistake in my humble opinion you may ask? This particular MR16 has only 1"-2" of the provided stake pushed into hard compact soil as seen above. The landscape contractor will then bring in a mixture of 2"-4" of bed prep (soil and mulch) to complete their installation. Over a short amount of time, the fixture will no longer be vertical but will have the customary look of many I see...falling over a bit to the right or left. Whether the maintenance crew, a squirrel, or soccer ball gently touches this light, IT WILL MOVE! The solution? Make your own stake out of a 12" plumbing pipe and a coupling. Drill a hole for the wire to exit and pound it into the ground. Your light fixture will be illuminating the plant specimen it was meant to for years to come. It's been a wonderful year for us and we're off and running in 2018. We're blessed to work with some great professionals in landscape architecture and construction and they referred us to many great projects. This was a banner year for total sales, but I didn't have to sell at all...my professional relationships did all the heavy lifting. Did I say blessed? We didn't travel as much this year as in past years. Projects were plentiful in Dallas and we experienced some growing pains in the crew department. Finding and keeping high quality crews has proven to be our achilles heal...the foundation is solid with Ernesto, but a strong #2 was missing. I'm confident as we move forward into 2018, as we have a returning rock star in chief Jose that will stabilize the workload. Sooo blessed to have him back in the saddle! 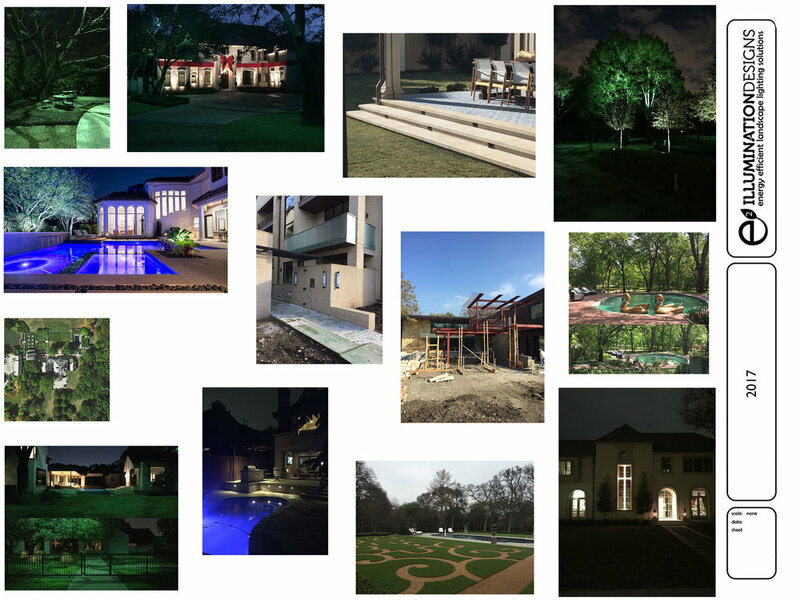 2018 has taken off with several high quality projects in Highland Park and University Park, as well as projects on the boards from a wonderful ranch south TX and estates under construction in Connecticut, Maine, and Missouri. Feel excited as to what the future will look like for E2 Illumination Designs and only wish my three boys were older so they could take some of the load off my shoulders. The greatest test I'll have this year will be trusting someone with managing the work load as I continue to design...I just love being on the job site too much. Wish me luck...I need to go play in the mud! The day to day experiences of outdoor lighting while traveling the country.